Australia Immigration has released the comprehensive list of occupations of the professionals who are willing to migrate to Australia in the year 2016-17. 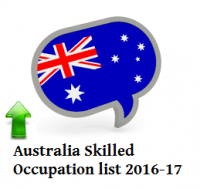 The list contains 194 occupations; it would be active from July 2016, for the immigrants who are going to enter Australia. The comprehensive list contains software professionals, medical professionals, skilled and semi skilled categories. The Department of Immigration and Border Protection will use the skilled occupation list to welcome qualified professionals under below categories. 485 (Graduate Temporary Visa) visa applications. The consolidate Skilled Occupation List and Skilled Occupation List; both are used for recruiting foreign nationals under this category. The Australia Immigration is planning for more changes to attract foreign nationals who can join the Australian workforce. The foreign nationals willing to migrate to Australia through the above categories must go through the national occupation list of Australia. The Candidates must undergo for skill assessment at approved assessing authorities suggested by Australia Immigration.